Big news, Döner fans. You may have heard of Mustafa’s Gemüsekebab before. You may have heard of the queues that snake through Kreuzberg just to catch a glimpse of his legendary kebab van. Well now he has another outlet, and it’s right here in Mitte! Yes, Mustafa’s Gemüsekebab can now be found at Hackescher Markt, making it highly convenient for a lunchtime repast. Having heard rumours of the joy that this man serves up between two slices of bread, my colleagues and I thought it best to traipse down to his shop and sample his wares. And so, last week, we did exactly that. 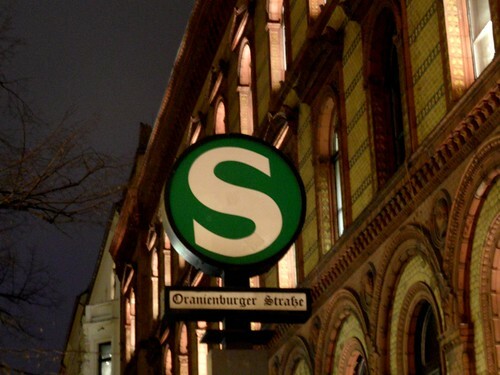 Alight at Oranienburger Straße to reach Mustafa's quickly. A modest queue of fellow kebab-buyers had already formed by the time we got there. Mustafa, it seemed, was doing good business. We got in line and were immediately assailed by the dreamiest of aromas as the flavours of his fine cuisine took to the air and filled our noses with spice. His vegetables looked fresh: indeed, mixed into his salad were sprigs of mint and flat-leafed parsley, imbuing the kebabs with a certain mouth-watering je ne sais quoi. Roast potato, aubergine and many other delights were mixed in with the chicken döner-meat, thereby making this an experience akin to few others in the world of the kebab. With our mouths slavering, we placed our orders. Presently we received our döners, and retired to the park to munch upon them. Conversation was scarce as the flavours collected in our mouths, and we devoured our fare with a newfound passion. I don’t know whether you have ever experienced a mouthgasm. But that is pretty close to what happened in the park that day. Delicious, filling and flavourful – at 3,00 € these were perhaps edging towards the more expensive end of the döner scale, but I would attest that it was worth it. Bravo Mustafa, you have impressed me. You may count Dr. Döner as one of your fans. Aferin sana! Last Thursday, my boss and I were on our way to an after-work event near Hermannplatz on the border between the districts of Kreuzberg and Neukölln. The event was advertised as a “cheese and wine party” and, like a pair of plebs, we had brought neither. Thinking that cheese and wine might not be sufficient to satisfy us after a long day at work, we thought it best to eat a kebab before going to the party. With the scene thus set, we went off to look for Döner. After walking past a few less-salubrious establishments in the area around Hermannplatz U-Bahn station, we happened upon the welcoming sight of the Antep Etoğlu Sofrası restaurant and decided that this was the place for us. A number of local families were also eating there, which is always a good sign, and the place essentially seemed to be a restaurant with a döner-hatch attached to it. We approached the döner-hatch. The restaurant specialises in lahmacun from Antep, so I thought it would be churlish not to try one. I ordered lahmacun with chicken and salad (minus the red cabbage) and with garlic and chilli sauce. We also ordered some Turkish tea or “çay” [chai] and sat down to a very enjoyable meal. There are sadly no original images of the meal or the restaurant, but I promise we did actually go there. We just didn’t have any working camera equipment with us. The lahmacun was very flavourful and tasted uniquely herby – I imagine this must be the special Antep way of making them. The salad was fresh and the meat was moist. All in all, an enjoyable repast. My boss ploughed through a vegetarian Zucchinipuffer and then munched her way into a large plate of baklava. We then both went to the cheese and wine party and ate even more food there. Start every meal with a kebab, Döner fans!